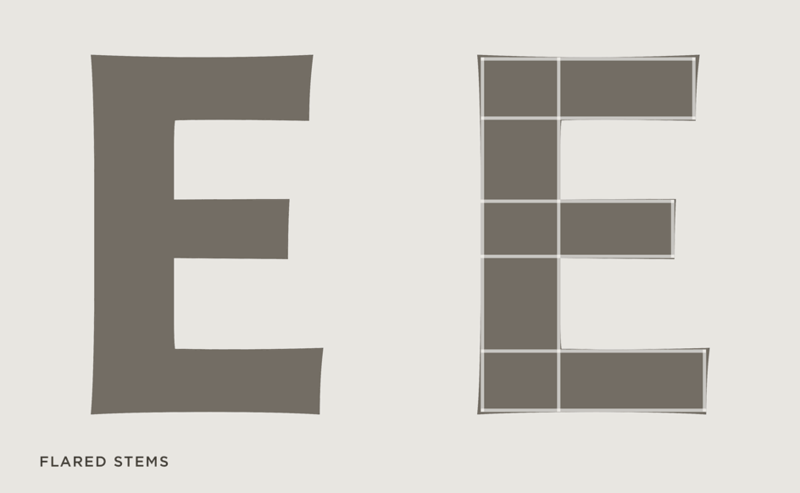 Ideal Sans Font Features: Texture | Hoefler & Co.
A rich and inviting texture. Like an object hewn from unexpected materials, or shaped by interesting tools, Ideal Sans has an organic and handmade quality that makes it engaging and satisfying to read. Fonts that emulate the behavior of specific tools are usually limited to specific applications. A typeface that looks calligraphic will be used for different purposes than one that looks spray painted, and neither is likely to be versatile enough to satisfy the wider range of voices that designers most often need to express. Ideal Sans uncouples the way letters are made from the way they’re interpreted — calligraphy minus the ceremony, markers minus the informality — and offers a visual vocabulary that captures the look of tools in general, rather than any one tool in particular. Characteristics of many different writing instruments have been brought together in Ideal Sans. From the broad-edged pen, it borrows the qualities of stress and contrast, but none of the thinness or rigidity associated with formal penmanship. Every stroke in Ideal Sans is bold and monolinear, and gently tapers in the center as if briskly written with a felt-tip pen, but the typeface rejects the soft corners and blunt line endings of marker drawings in favor of the precision of the pencil point. By not literally recording the look of letters made in any one specific way, Ideal Sans manages to more broadly convey the properties of all kinds of handmade forms. In different contexts, the design can suggest paper and scissors, overinked printing types, the stonemason’s chisel, or the signpainter’s brush. Ideal Sans achieves an organic quality by almost completely avoiding straight lines. Its stems are flared, tapering outward as they reach their ends, and their curvature varies in shape from one part of a letter to the next. Distinctive in large sizes and richly textured when set small, these tiny asymmetries create the sort of lively atmosphere and syncopated rhythm usually found only in seriffed text faces. A recurring motif in Ideal Sans is the inclined angle. Strokes that start flat at the baseline grow organically into flaring stems with canted endings, a detail that’s echoed in major structural elements like the gently angled crossbar of the lowercase e. This pattern of upward thrust gives the font energy and alertness, and contributes to its lively hum at text sizes. 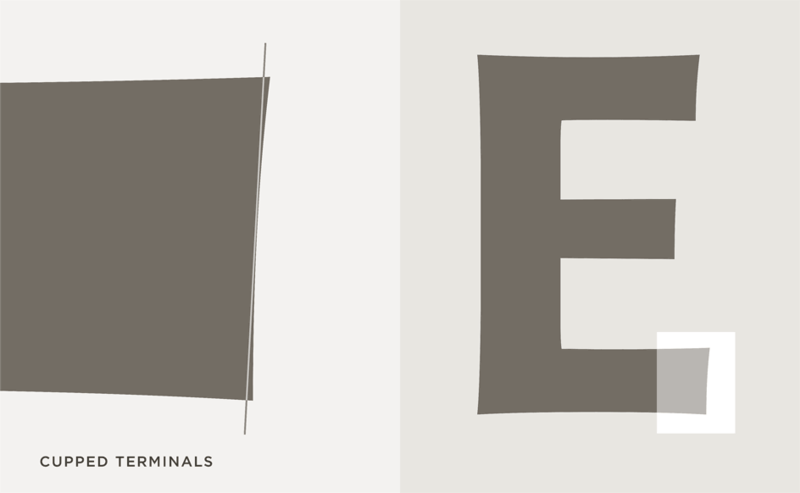 Ideal Sans’s themes of flaring and diagonality are combined in its stroke endings, which are both angled and concave. This gesture produces a vacuum effect that seems to freeze the type in place, while heightening the crispness of the typeface by sharpening its right angles into acute ones. Even these small details are not reproduced without variation: in this capital E, all three arms terminate at different lengths, with different angles, and with different curves. All typefaces exhibit vestiges of calligraphy. Even the most mechanical sans serif has thicker vertical strokes than horizontal ones, and diagonal strokes that are heavier in one direction than the other; these are remnants of the calligraphic tradition, in which letters were made with a broad-edged pen held in the right hand. One of the goals of Ideal Sans was to explore these natural tendencies, and see how much they could be amplified before becoming detectable. Looking at a letterform from the back can be an illuminating way of spotting the optical illusions that we accept as part of the natural shape of a letter. Above, reversing a well-balanced capital S reveals that it achieves its ‘normal’ posture by being high waisted, forward-leaning, and thicker in the center than at either end. Seen from the back, a straightforward lowercase p exhibits pronounced calligraphic mannerisms: the upward incline of its bowl, the angles of its stroke endings, and the extreme thinning of its weight wherever its strokes converge. Every character in Ideal Sans is a meditation on these optical illusions, right down to the oblique asymmetric oval that forms the dot on the lowercase i.